It’s been 6 months since the last Nakatomi-Wide MYSTERY TUBE SALE, and people’s sanity has returned, and so we’re ready to go AROUND THE WHEEL OF MADNESS AGAIN! We have more tubes than ever before- about 250, with a few more tubes-worth of prints waiting on stand-by…so hopefully those who want one can get one! Starting somewhere between noon and 2pm CENTRAL TIME on TUESDAY April 22nd , we’ll have tubes for purchase for $50 each. Each tube will have 5 prints in it-all suitable for framing. Some are considered ‘scratch/dent’ in that there’s minor printing flaws or a ‘soft’ corner, but nothing that won’t frame out. The quick and dirty is this- you’ll get 5 random prints from Nakatomi artists past and present, and a shot at some really great bonus prints for $50. You will get ONE of the four final prints in this series in each tube you order. 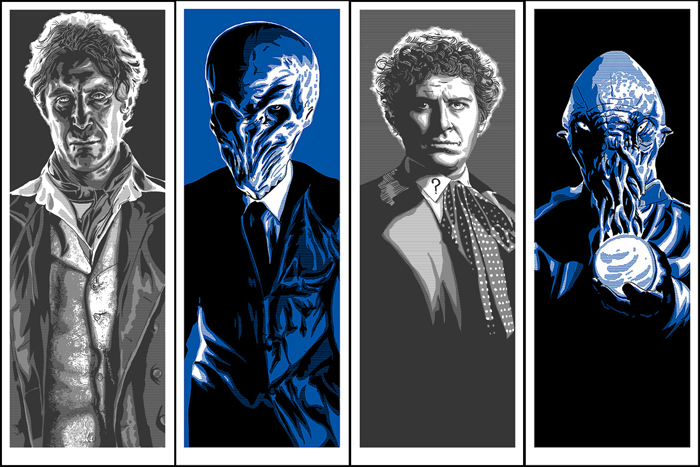 We’re celebrating the Good Doctor’s 50th year with this series of prints, and THIS SERIES has BEEN POPULAR, EH? (each one of those links contains evidence of flipping past prints in this series…Warning!) Each of these 9×24 prints will be signed and numbered by the artist, and will ONLY be available through this tube sale! Each will also have a variant silver metallic ink edition of 20. These will be our FINAL prints in this particular series! You are welcome to buy as many tubes as you want- you will receive a copy of one of the exclusive print in each tube. One tube per order- we cannot combine shipping- as we can only fit 5 prints in each tube! Holy geez, that stuff is cray-cray. HERE’S MORE! Test Sheets! We’re randomly inserting a totally awesome and unique test-sheet with orders! A test sheet is like 4 posters flying at your optic nerve at ONCE! Truly a byproduct of the Silk-screen process, we run screens on scrap paper as we’re working on a project, and what you get is a random collage of color building up on a sheet of paper, until we judge that it’s ‘done’ and throw it on our stack of test sheets! There’s an awful lot of the Unreal Estate 3′s screens that were in this crop, that made just crazy, haunting images! 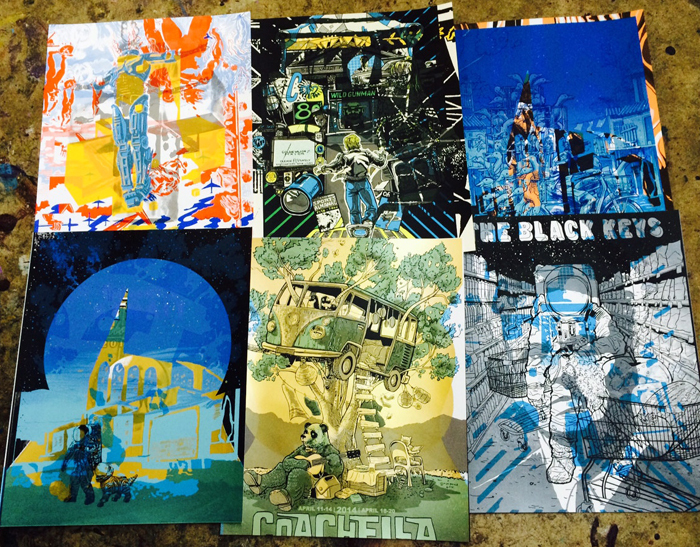 We got towards the bottom of our pile this year, and unearthed some awesome Black Keys and Primus sheets from a while ago! 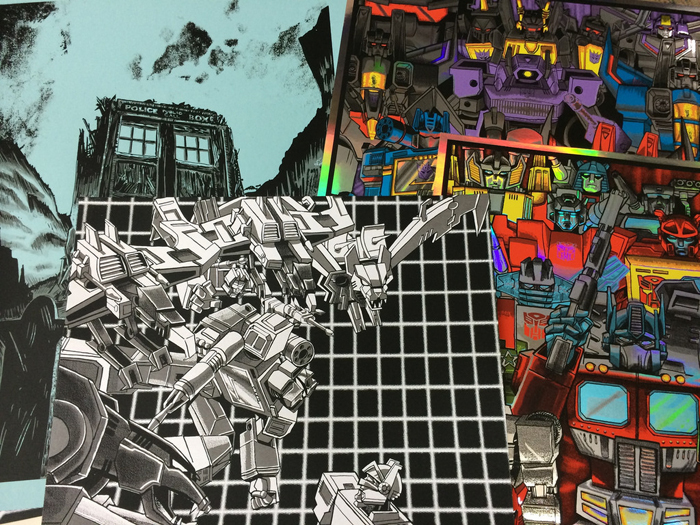 We’ve got 2 copies each of Doyle’s Silver Foil Transformers prints (each valued at $75-$90 each, 5 copies of the blue line-art variant of ‘Fields of Trenzalore’ (edition of 25) that were only given out as X-mas gifts to a select group of people, as well as 10 copies of the BW Line-art variant of the Privately Commissioned ‘Home Taping is Killing Each Other’ Transformers print on metallic paper, that was never available online! We’ve got 2 AP copies of the super-rare (edition of 25) Bernie Wrightson’s “You’re New Here, Aren’t You?” that was randomly inserted into orders for the main print! 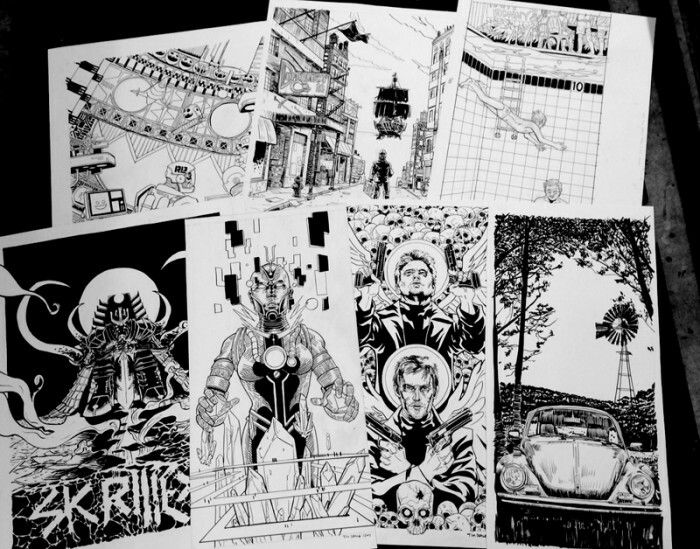 Original art for Skrillex, a MUSE gigposter, Boondock Saints, an album cover for Head for the Hills, Rushmore from the original Bad Dads show in 2010, and more! Each of these would sell at a gallery for $300-600, and we’re JUST GIVING IT AWAY. We’ve got copies of some older prints that have been kicking around the shop for a bit- acquired from a friend of the store! The Warriors print is signed and numbered by Stout! 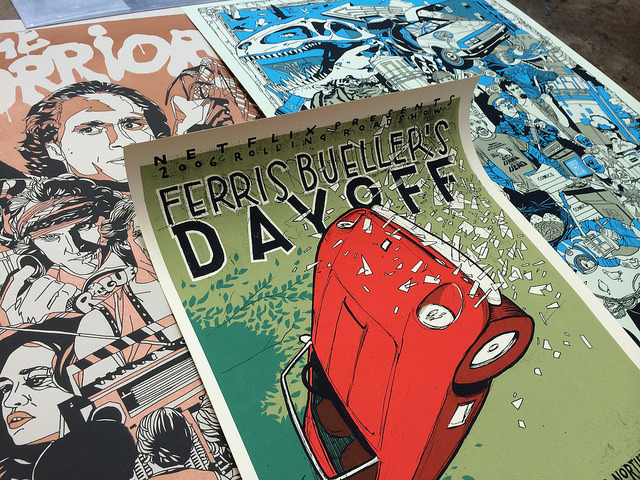 Both the SPACED and WARRIORS prints are in sharp condition, and the Ferris Bueller by Jay Ryan is in decent enough shape! 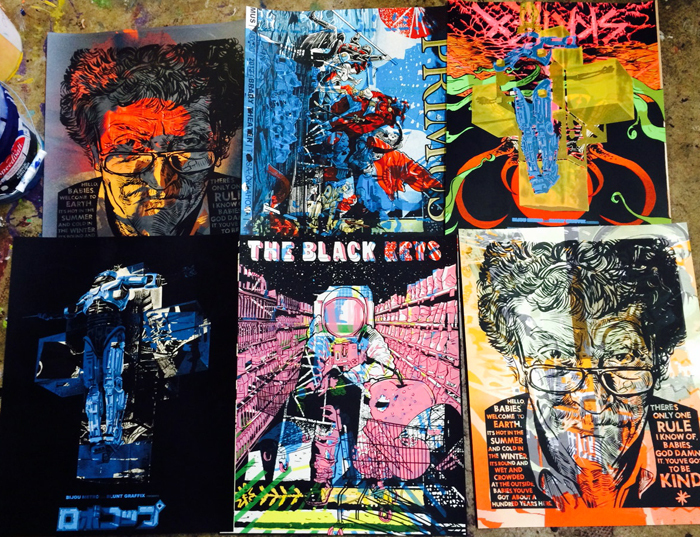 Each of these prints sells between $300-500, and we’re releasing them back into the wild…FOR YOU. This is only a small selection of what’s going in these tubes, with plenty more surprises! With all this awesome, your odds of striking gold are PRETTY DANG GOOD. Please note- these tubes are blind-packed, and we have no idea what prints are in what tubes at this point! Get your clicky fingers ready- we’ve never had a Nakatomi tube sale NOT sell out- we’re being a little more ambiguous about the drop time, as we’ve had massive server issues during these high-demand drops before, and we’re trying to cut down on that here. But as always- it’s going to be a slog getting through check-out once word spreads that these are up for sale. Trust us- we’ll do what we can, but it’s rarely enough. ← Electric Instrument Co.- Fender Guitar print by Jacob Borshard!